Energize yourself on your lunch break with Community Yoga every Wednesday at 12pm – 12:30pm in the Big Room. Modern Spirit will guide you through a 30-minute dynamic, moving meditation paired with ambient sounds to help relieve and unravel the stress and tension inherent in our daily modern grind. This is a yoga experience open to beginners and seasoned practitioners alike. 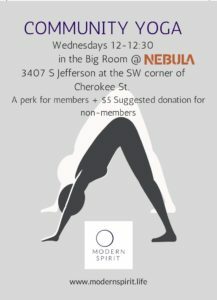 A perk for Nebula members, and $5 suggested donation for non-members. Guests can enter Nebula through the main entrance located on Jefferson Avenue. We have plenty of mats + blocks, but feel free to bring your own if you have one.